The most distinguishing feature of the CLASS plan will be the benefit features. Most private insurance’s benefits are rule-based where limits and restrictions are specifically designated to control claim costs. Recognizing that each beneficiary’s needs are unique, CLASS benefits are beneficiary-driven. Beneficiaries can expect to have greater control on how benefit dollars are spent than in private plans. A relatively novel feature is the increasing premium schedule. We believe it has a clear advantage over level premium plans because of its low entry price point. Compared with many group long-term care insurance programs where the option for benefit increases requires increasingly expensive premiums (commonly known as Guaranteed Purchase Option), the scheduled premiums in CLASS are known in advance and level in later ages. Thus CLASS offers more affordable inflation protection because there is no price pressure during retirement. 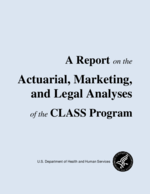 Lastly, unlike private insurance, CLASS plan’s benefits will vary by the level of disability. Approximately half of the large employers already have group long-term care insurance in place. A significant number of them no longer enroll workers. This can present an opportunity for the CLASS Program to be the successor insurer for future enrollments. CLASS can be the sole insurer by offering an optional number of units of insurance, with a $50 daily benefit as one unit. Alternatively, CLASS can partner with a private insurer to offer a packaged program. The CLASS Program can compete directly against private insurance or work in concert with it. As a competitor in the private insurance’s space, the CLASS Program can offer coverage of multiple units of a $50 initial daily benefit. However, CLASS may be at a disadvantage because we currently have no intention to factor in significant marketing costs. Driven by commissions, insurance brokers would likely sell against CLASS. As an alternative approach, the CLASS Program can focus on the low to middle income workers where private insurance has generally been unsuccessful. However, since they have limited discretionary income for insurance, enrollments will likely be low. Moreover, it is our impression that claim experience in other types of insurance has been generally unfavorable for these workers. A better approach would be for private insurance to be a supplemental plan to the CLASS plan. The CLASS plan would provide the first layer of coverage. If the enrollee desires more coverage and is insurable (this may or may not be a requirement), he or she can purchase the private plan at the same time or in the future. The CLASS Program would benefit because the package will be co-marketed. The CLASS Program would gain a broader spread of risk by attracting higher income workers. Private insurance would benefit from the publicity and awareness generated by the CLASS Program. A potential issue is having private insurance conforms to the CLASS plan’s features regarding benefit eligibility, benefits, etc. The CLASS Program can set up plan feature criteria whereby private plan can receive a “seal of approval” to market along with the CLASS plan. The list would include features that make the private plan resemble the CLASS plan as closely as possible. Another potential issue is the coordination of enrollment and premium administration. Still another idea is for the insurers act as reinsurers for CLASS. Insurers would assume the morbidity risk while CLASS retains to persistency, investment return, inflation and expense risks. For the consumers, a partnership might be a stronger brand than the individual competing entities. The product would be seamless and premium rate stability could be enhanced. The CLASS Program would reduce its exposure for morbidity risk, get more enrollments than by it alone, and possibly achieve certain administrative cost savings. For the insurers, this partnership could ensure their future growth in the morbidity risk segment of their business where they have sufficient experience and is less problematic than other risks (for example, investment risk). It could revitalize their sales. Internally, the reinsurance arrangement would be a yearly assessment of the actual claim experience to the expected claims in the premiums (with a long period of commitment). The arrangement would have the insurer pay claims up to, say, 160% of actual to expected claims. Beyond 160%, CLASS will have to absorb the risk, meaning there would likely be a premium rate increase at that point. Externally, the plan could possibly take on certain design differences by the insurers (such as benefit period, premium schedule, etc.) while keeping the basic CLASS features. We expect that the CLASS plan premiums will be slightly more expensive with this arrangement due to reinsurance costs.